From deciding on a layout to choosing the right fixtures, a bathroom renovation involves lots of planning. Another important part of your new bathroom is storage, which can sometimes cause a few problems in a small space such as a cloakroom or en-suite. But regardless of the shape or size of your bathroom, you will need to incorporate some form of storage to hide any clutter. 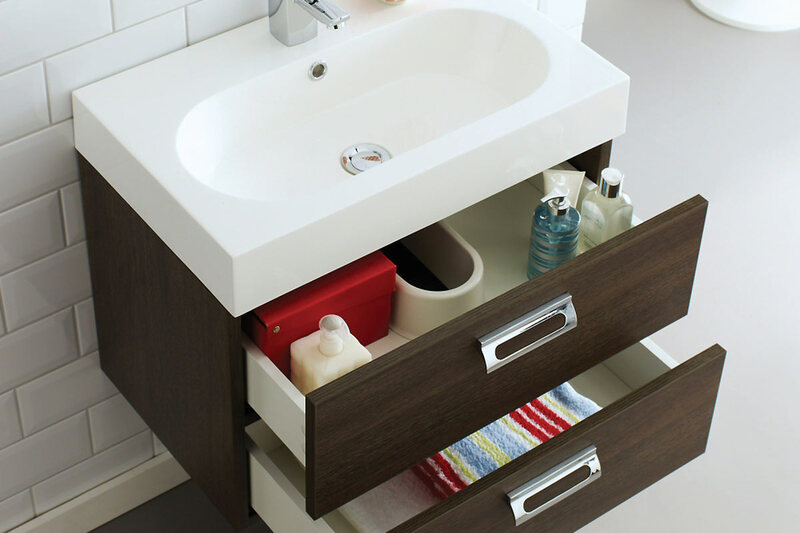 From vanity units to mirrored cabinets, there’s a wide range of bathroom furniture and storage solutions to choose from. When shopping for storage, it’s important to take into consideration which room it’s for; is it for an ensuite, cloakroom or the main family bathroom? You will also need to think about who and how many of you use the bathroom, as well as the size and style of the space. Vanity units are one of the most popular ways to add storage to any bathroom no matter how big or small. They combine a sink and storage into one handy unit, which means you don’t have to fit a separate basin and cabinet. A bathroom vanity unit will keep essential items close to hand yet neatly hidden away from view to ensure an organised space. Some vanity units have matching cabinets and WC base units available so you can create a co-ordinated scheme. These can be positioned next to the vanity unit to create a run of units, or they can be fitted in a different area of your bathroom. WC base units are designed for use with a back to wall toilet and concealed cistern. The space on top of the unit creates a handy shelf for toiletries or a decorative display. Mirrored cabinets provide another storage solution, and are typically fitted above the basin to make the best use of wall space. A great way to keep toiletries within easy reach, some cabinets incorporate LED lights, digital clocks and heated demister pads to make your morning routine easier. Other bathroom storage ideas include placing wicker baskets underneath or next to the basin so you can keep towels or loo roll close to hand. A wicker basket will warm up pale décor and add a rustic touch too. You can also fit wood or glass bathroom shelves to display perfume or decorative objects, as well as hooks and rails to keep towels neat and tidy. Available in modern and traditional deigns, as well as an array of sizes, vanity units can add a stylish focal point to your bathroom. Modern vanity units feature high gloss finishes and sleek designs, while traditional models feature wood effect finishes and more detailing. There’s also a wide range of colours to take your pick from too, so you can easily create the look that you really desire. A unit in a striking colour will really stand out from the rest of your bathroom suite. If you have a large bathroom you could fit a vanity unit with a double basin for a luxury look, and to put an end to jostling over the basin on those busy weekday mornings. Just because you have a small bathroom it doesn’t mean that you can’t incorporate any storage. Corner vanity units are ideal for making the most of a tricky space that would most likely get unused. A corner vanity unit fits neatly into to the corner of the room to maximise space. When choosing a vanity unit ensure that you have accurately measured the space and make sure any doors or drawers can fully open. Cloakroom vanity units provide another fantastic solution for a small bathroom – these feature a neat, slimline design to save space. Wall hung vanity units are also ideal, as they make the room appear bigger and appear more spacious. By reflecting the light, a high gloss white finish will help to enhance a sense of space too. Other ways to make a small bathroom feel bigger include fitting a large mirror to bounce the light around, choosing large tiles so there’s fewer grout lines, letting in as much natural light as possible and avoiding dark colours to prevent the space from feeling cramped.